San Francisco, CA, February 06, 2018 --(PR.com)-- San Francisco, Feb. 2, 2018, GetTransfer Limited, an online marketplace for pre-booked long distance transfers in Europe and US, is pleased to announce that it has raised its Series A funding round from S7 Group, a member of the oneworld® global aviation alliance. Over the last 12 months, www.GetTransfer.com has significantly grown its footprint with travellers in Europe. It has proven to be a very popular proposition for transfers relating to both holiday and business trips. Today, more than 13,000 vehicles are registered on its platform and the service can be used in over 100 countries globally. The company will use the new funds to further expand its service in the UK and the US. "We are very happy to partner up with S7 Group. In 2017, S7 carried more than 14.2 million passengers worldwide, so the synergies between S7 and GetTransfer.com are obvious. Together we will be able to help our clients save on travel substantially and offer a convenient and easily accessible service," said Alexander Pershikov, the founder of GetTransfer.com . S7 Investment Director, Oleg Gordienko, commented, "We see significant cost benefits for our clients by partnering up with GetTransfer.com. We are excited about being part of a new and fast growing mobility startup. Each segment of travel is more connected going forward. We share the company's vision and believe in its long term success." Several previous investors, including Castel Capital, are also participating in this round. www.GetTransfer.com was founded in 2015 by Alexander Pershikov to make long distance transfers more affordable. GetTransfer.com is an online platform for pre-booked transfers and car rental with driver. The service operates worldwide. S7 Group is the largest private aviation and space holding company in Russia comprising air transportation, maintenance and space operation companies. 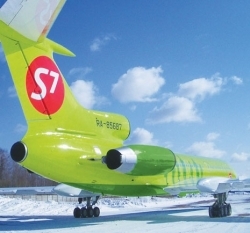 In particular, S7 Airlines, a oneworld® alliance member, serves 162 routes in 26 countries across CIS, Europe, Middle East, South-East Asia and Asia-Pacific region.